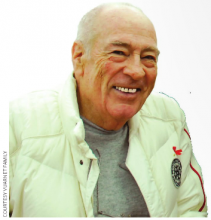 Jean Vuarnet, Olympic champion in downhill at the 1960 Squaw Valley Olympics, founder of the Avoriaz ski resort and of a successful eyewear and fashion company, died January 1 after a stroke. He was 83 years old. Raised in Morzine, Vuarnet skied for the University of Grenoble, while studying for a law degree. With his coach George Joubert, in 1956 he published the influential book Ski ABC, the first of five books expertly explaining the technique of all elite ski racers. Among other topics, the books formalized the description of the aerodynamic “oeuf” or “egg” position for downhill racing speed. Beginning in 1957, Vuarnet won national championships in all three disciplines, slalom, GS and downhill, and the bronze in downhill at the 1958 FIS World Championships at Bad Gastein. He married the racer Edith Bonlieu. At the 1960 Olympics he was the surprise winner of the Squaw Valley downhill, after the favorite, Adrien Duvillard, crashed. It was the first Olympic victory on metal skis. Vuarnet returned to Morzine as director of tourism, and launched a wildly successful line of sunglasses under his own name. He guided development of the Avoriaz resort, which opened in 1966 on a neighboring plateau. Avoriaz became the center of the 11-resort Portes du Soleil complex. From 1968 to 1972, the era of Gustavo Thoeni and Piero Gros, Vuarnet coached the Italian ski team. He then accepted a vice presidency of the French Ski Federation, where he had the misfortune to supervise a crisis in team management under Georges Joubert, leading to the firing of six top racers. Beginning in 1987, in partnership with his son Pierre, Vuarnet expanded the sunglass brand into a worldwide sportswear empire. Tragedy struck in 1995, when Edith and Patrick, youngest of the three Vuarnet sons, died in a mass suicide by members of a cult religion. The following year Vuarnet moved to Canada and reunited with Christiane, with whom he had had an affair at age 19. He learned that he had a 42-year old daughter. Vuarnet and Christiane married in 1998. Following her death in 2012, Vuarnet returned to France and spent his final years in Sallanches.